Prepared by Michelle Bufkin, AU Agriculture Communications Student/EDEN Community of Practice Social Media Assistant. Disaster Master is an 8-level game that tests children’s knowledge about how to react before, during, and after a disaster. The player must answer questions correctly to accumulate enough points to unlock the next level, which include: wildfire, tornado, hurricane/blackout, home fire, winter storm, tsunami/earthquake, thunderstorm/lightning, and the hot seat. Each level tells a story and asks multiple choice questions about what the characters should do to survive the disaster. If the question is answered correctly the player continues to the next level, but if it is answered incorrectly the game could be ended. A graphic novel is also available to print after every level. This game is an easy, entertaining, and engaging way to help teach your children about what to do to prepare for an emergency. A Spanish version is also available. Build a Kit places you in multiple scenarios and tells you to pick items to place in your emergency kit. Once you submit your items it tells you what you have included and what you forgotten. You can print your list at the end of the game. 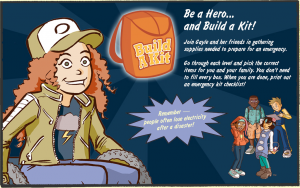 This game, available in English and Spanish, is a quick and easy way for children to begin learning what goes into an emergency kit so they can help prepare for a disaster. Disaster Hero is a multilevel video game that tests children’s (grades 1 through 8) knowledge about natural disasters, such as earthquakes, hurricanes, tornadoes, and floods. Disaster Hero allows the player to choose an experience level, and then launches into an age appropriate narration. Each level contains games pertaining to what to do before, during and after each disaster, including: make a kit, get to a safe room, stay informed, clean up, and first aid. In each game questions pertaining to the disaster at hand are asked, and points are given for correct answers. Each disaster has a bonus round where the knowledge about that disaster is tested once again. This game is an interesting and entertaining way to help your children solidify what they should do before, during, and after a natural disaster.